The Cold Kids and Campfires Tour Part 2 stopped at Fubar in St. Louis, Missouri on January 18th 2016. 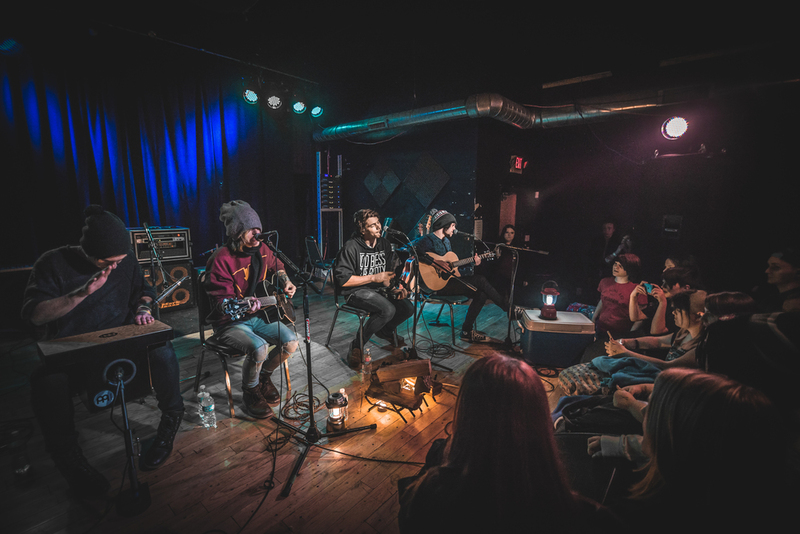 Headlining the show was Chicago alternative bands, 7 Minutes in Heaven, Marina City and Virginia's Pop/Punk group, Broadside. Supporting groups were Life on Broadway, of Centralia, Illinois and This Is Our Dance, of STL. While the name of the tour may seem just like a clever label for a winter circuit, the fans lived up to it. Lining up hours before the show to guarantee a spot close to the action, even in the sub-freezing temperatures, the weather couldn't break these devoted fans spirits. As the doors open and the guests start coming in, the bands meet with some of the concert goers. The laughter and chatter throughout the venue grows as the excitement turns into a lively social gathering. Stage time has come and the first artist takes the stage. This Is Our Dance steps up to the stage and starts his performance. He delivers a loop backed performance as vocalist. This is definitely not his first time in the spotlight, having shared the stage with acts in the past such as Alex Goot and Sam Tsui. His lyrics are well written and backing instrumentals evenly balanced for nice vibes. Throughout the performance he consistently delivers passionate ranges of vocal and engagement with the audience and gives insight into the upcoming songs. Encircling his music were obvious hints at life and love. Emotions that accompany events and growing up. Everything from deep metaphors in "Beyond the Horizon" to much more apparent and almost epiphanic verses in "Now I'm Listening" where a simple gesture of listening can slowly mend issues of a relationships past, if it hasn't been delayed too long. The local favorite, Life On Broadway takes stage and the fans give a loud yell. Being familiar with their songs, you could hear the crowd singing along. Although the show was an acoustic gig, these guys brought their rock game. This performance marked a neat moment for them as it was almost 1 year to the date (1 year 4 days to be exact) since they first took the stage as a band. What makes it even more memorable, is that this is their second consecutive year playing with the Cold Kids and Campfires tour at FUBAR ST. Louis with 7 minutes in Heaven. From the sounds of the crowd, they have a lot to look forward to in the future. There isn't an easy way to put this, Marina City is not your run of the mill band. They take control of the crowd and deliver. From engaging the audience on "longest claps game" to talking to individual crowd members, these guys mesmerize the group. Their talent doesn't lay solely in any one band member, yet as a unified team that works together like a well oiled machine. Their genuine smiles and anecdotes made you feel a sincerity in their message. Marina City is a band who definitely explores their musical boundaries and likes to push the envelope on genre norms. They will, without a doubt, be a band to watch rise the charts. As a last minute addition to the photo access from Victory Records, it was a pleasant surprise to get to work with this group. 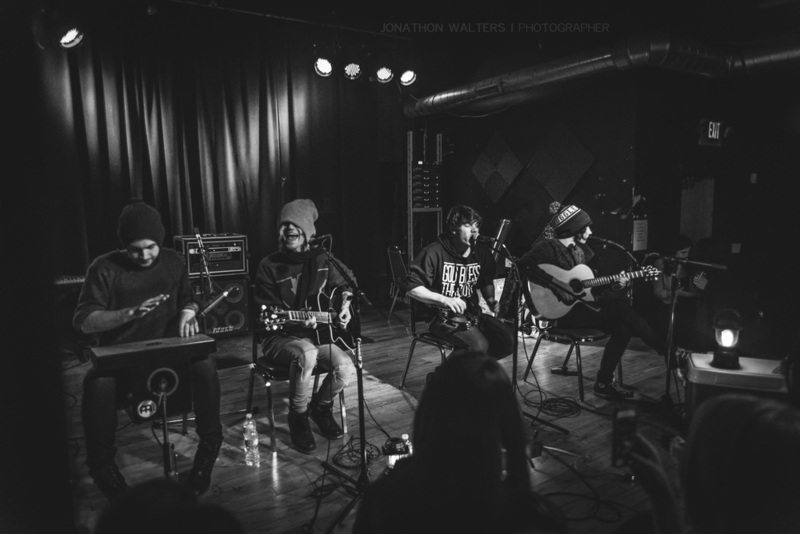 Only 2/5 of the band played this acoustic show for the Cold Kids and Campfires tour but brought 110% of a rock show! The emotions behind this duet onstage is unreal. Even as veteran live music photographer, I found myself intrigued by the emotion packed into their music and for a few moments, just let my camera down and listened. Headlining an event comes with its advantages and drawbacks. Playing last on a workday/school night can be a less than favorable position, however this crowd held out until the very end. In a true campfire like fashion, the audience huddles the stage and adores the charming 7 minutes in Heaven crew. The scene fit nicely with the theme of the tour. Sweaters and sock hats nestled snuggly to a makeshift "campfire", the group brought the evening to a calm finale while delivering to that audience who had just seen 5 amazing bands. The crowd energy didn't fade out until the last note was strummed. The line-up had the crowd looking to start marking their calendars in anticipation of a part 3 of the awesome tour. More photos available of all the bands here. Please subscribe to see new reviews, band photos, and helpful photography tips and tricks.